Marvelous contrast between the dark leaves and white blooms. Flowering Date The peace lily tends to bloom whenever, but mostly in the spring and the summer. 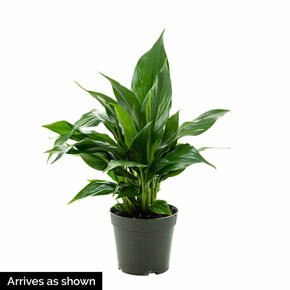 Flowering Date: The peace lily tends to bloom whenever, but mostly in the spring and the summer. Winter Care: Water the peace lily less. 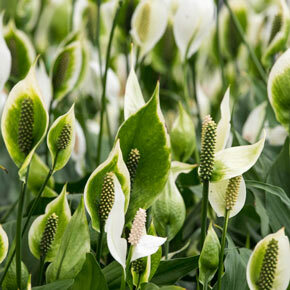 There is no dormant season for a peace lily, so it will continue growing year-round. Flower Form: One large, white petal enveloping the central white stalk. Pruning: Prune yellowing leaves or drooping leaves as necessary. Dead flowers can be cut as well to stimulate new growth. Soil Requirement: Keep the soil moist but do not oversaturate the lily. Watering Requirement: Keep the soil moist. A sign that you need to water the peace lily is if the leaves are drooping. Do not overwater the plant and be careful to not leave any standing water in the soil. This will destroy the peace lily's root system. Additional Information: Mildly to moderately toxic to pets.